The Aesthetics of Composition in Abstract Painting: Artwork of the month: The splendor of white asparagus. Artwork of the month: The splendor of white asparagus. This is one of my favorite oil paintings at the Minneapolis Institute of Arts. The scene is one of an upper middle class household, the wife purchasing fresh asparagus from a door to door vender. The wife's hand open and waiting for her husband, we presume, to give her money to buy the food. White asparagus short growing season which made it rare an expensive. While we believe we are watching this scene with the wife as the main character, we see clearly that the maid sewing is the main focus. She is the only illuminated character in the scene. she is clearly the most important individual in the room. 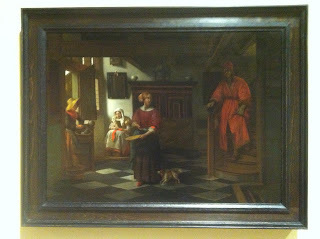 The maid in the background is painted with greater detail, and greater emotion. The sun shines through the window revealing her alone. I have always enjoyed this painting just for that.